Now that the temps are beginning to dip more and more everyday, I want to provide some suggestions you may want to consider if you're in the market for a new coat. I personally feel that we should invest in at least one good quality coat because it's a piece that we wear everyday and one that we'd ideally want to keep for years to come. When investing in anything, you always want to pay attention to quality, style and color to ensure that it'll be practical for and hold up to your everyday lifestyle and personal needs, and in this case, body shape! I have personally experienced purchasing a coat simply because I loved it and not so much because the fit was perfect for my shape, which ended up being a waste of money and time because I eventually got rid of it. Hopefully this post will help save your wallets and frustration by providing you with key things you'll want to consider when it comes to fit and style. As for color, I highly suggest you invest in a basic neutral such as black, taupe (grey) or navy, which will be sure to go with everything in your closet. After you have one of these colors in your wardrobe, you can feel free to add in other colors and prints. Lastly, when it comes to the quality of the coat, I suggest you purchase a style that contains either wool, cashmere or both, since such fabrics will guarantee to not only keep you looking cute, but warm, too, which is equally important for the fashion conscious ;) So, let's get started! 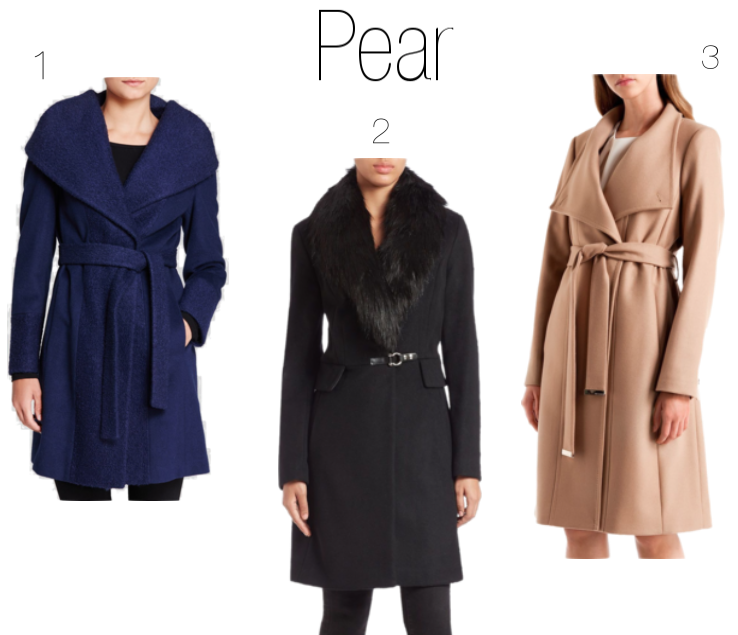 For all my fellow pear shapes, I suggest a coat that has a large dramatic collar and a straight shape with a wrap belt. The large collar will help to balance out your wider hips and the straight shape will prevent any additional width to the hip area being added, which is important, especially, when wearing larger fabrics underneath! Also, the wrap belt will help cinch your waist, establishing a nice balance between the larger collar and lower curves! 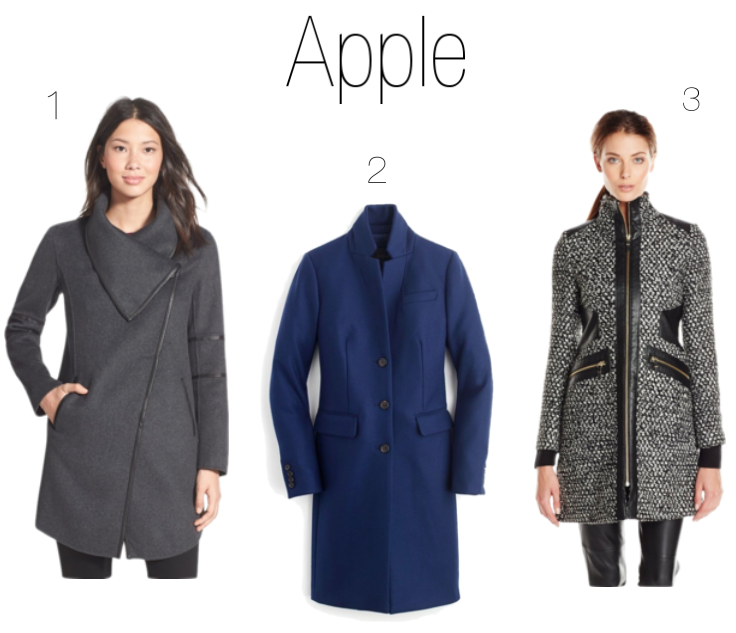 I have to share my frustration in selecting these three coats for all my lovely apple shapes. Can you believe it took me 2hrs to find a coat that was decent in color, style and price for this particular shape? This pissed me off to say the least because it just goes to show how designers are not keeping all body shapes in mind when developing their collections, which is quite ridiculous! You guys, you have to believe with me that one day I'll have the opportunity to be a creative director for a line to ensure that all body shapes are fairly represented, ok?! 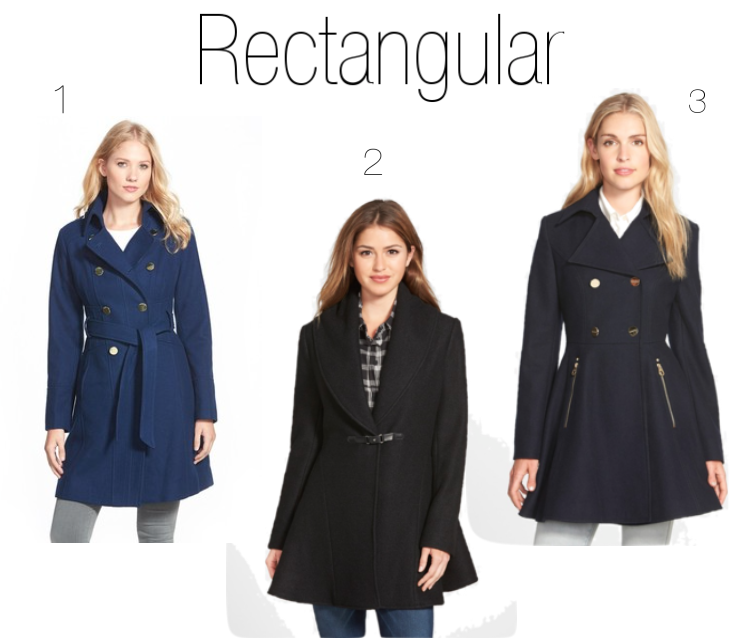 Enough of my rant and onto what you should look for when shopping for coats! For your shape, I highly suggest you avoid styles that have a double breast, large oversized collars and that are cropped. A large collar or double breast will make your bust and depending on the style, shoulders appear larger and wider. Cropped styles will draw attention to a fuller midsection and with the added fabric, can also make it appear larger. So, instead look for single buttoned or buttonless styles, which will streamline your look, causing the eye to move downwards, rather than across. Or, you can look for a coat that has an asymmetrical cut, which will also help draw attention away from the midsection. For all my rectangular shapes, the key thing you want to consider when selecting that perfect coat is a style that helps create a shape. Such styles include skirted or flared, as well as those that have waist or wrap belts. Double breasts are also great because they help to play up your bust area. 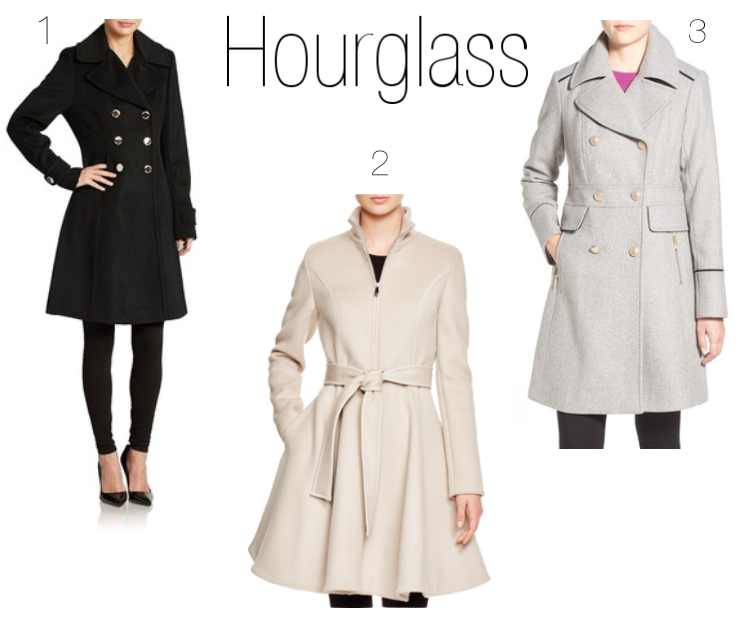 For my hourglass shapes, you want to select a coat that highlights your curves, not flattens them! The best style would be one that has a fit and flare shape or skirted bottom, as it will mimic your natural shape, brining it through the coat, instead of concealing it underneath! I hope you all found this post helpful in selecting the best coat style for your body shape; don't know your body shape?! Watch my video on how to measure yourself to determine your shape! If you keep all the tips I've mentioned in mind, it will save you so much time in trying on a bunch of styles that weren't made with your particular body shape in mind. Remember, you do want also consider your personal style when shopping, so look for buttons, zippers or small little accents that represent your style most! Thanks so much for stopping by and I hope your day is as amazing as YOU! Next: Cozy x Casual Previous: An Easy Trick to Revamp Your Coat!